I enjoy shooting animals (with my camera only of course) as they radiate such simplicity and serenity. When taking a photo, I try to bring out the character of the species, a portrait of its inspiring qualities. Thus, when viewing the captured photo, I can always vibrate to the animal's essence and personality. Please click on the photo to enlarge. Enjoy! I attracted this red squirrel with peanuts but it eats a wide-variety of foods including insects, seeds, bark, nuts, fruits, mushrooms and pine seeds or cones. Sometimes it eats insects, young birds, mice and rabbits. A large part of its diet is made up of pine seeds. In the fall, it will cut green pine cones from trees and store them in the ground. It also stores nuts and seeds in piles or middens under logs, at the base of trees and underground. The red squirrel also drinks tree sap from maple trees. It bites a tree until the sap flows out and returns to drink it after the water in the sap has evaporated. 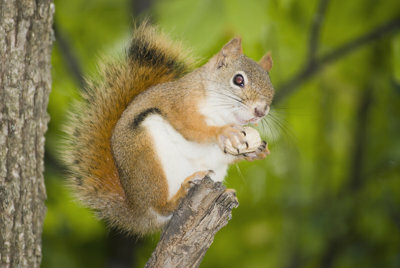 The red squirrel is most active in the early morning and the late afternoon. It is a solitary animal, except for mothers and their young. The red squirrel defend its territory and is very vocal and chatters, growls and screeches. This woodchuck groundhog built its home a few meters away from Billings Bridge Mall, corner of busy Bank and Riverside streets. Generally herbivorous, groundhogs subsist primarily on wild grasses and other vegetation, supplementing their diet with berries. 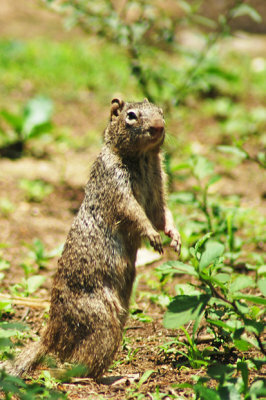 Partially omnivorous, groundhogs will also eat grubs, grasshoppers, insects, snails and other small animals. 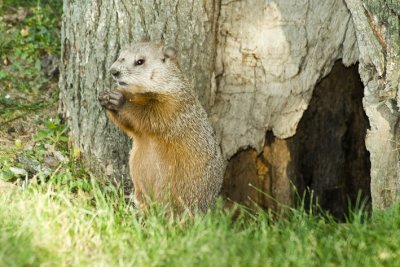 Groundhogs are excellent burrowers, using underground burrows for sleeping, rearing young, and hibernating. In Ottawa, it's common to see such wild animals such as hares and squirrels on neighbourhood lawns and parks. This groundhog came out of its domain to watch people stroll by, and then continued to munch its vegetarian brunch. This gopher seems to wonder what I'm doing there in his forest. Gopher is a small burrowing rodent, digging tunnels and subterranean chambers. They disrupt human plans for the surface as commercial agriculture, garden plots, and some landscaping by their underground activities, and are often considered as pests - they feed mainly on plant roots. Their underground burrows can be very deep, 1-2 meters, and several hundred meters in length. As gophers dig burrows, pushing the soil to the surface, they leave a mound, usually in a fan shaped. 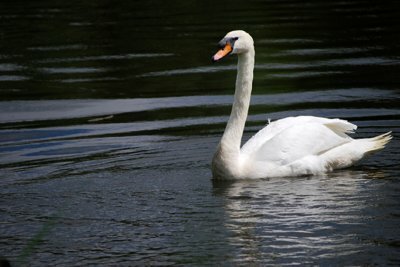 This swam is a descendant from the white swans given by Queen Elizabeth 11 in 1998. They find refuse on the Rideau River flowing through the city of Ottawa, capital of Canada. 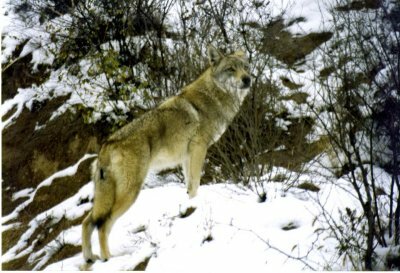 This wolf was caught in the Himalayan region of Tibet to reside permanently in the Badalin Safari north of Beijing. They are generally found in parts of Central China, southwest-Russia, Manchuria, Tibet and the Himalayan regions of India, Nepal and Bhutan. As there are only an estimated 6000 left surviving in the Himalayans, the Tibetan Wolf is threatened to disappear as it is hunted for its fur and its teeth. To Tibetans, amulets have more importance of warding off evil comparing with the ornamental value. They believe when you wear the amulet on the pivotal position of you body, it protects you from devils' incursion and bring you peace. These twin camels waited patiently for me while I was getting lessons from the guide on how to ride a camel. At SHAPOTOU, 20km west of Zongwei Ningxia Province at the fringe of the Tengger Desert (Gobi Desert west), there's hardly any vegetation yet this city attracts many retired citizens. 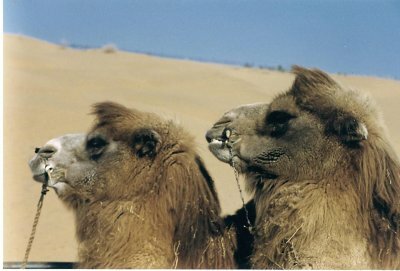 Camels are precious animals contributing not only as transportation to the nomadic life, but also for milk and hair for survival. They look docile and innocent but they seem to be mean when they don't feel comfortable towards their rider. By the way, the rocky movements of my camel twisted my spine for 2 hours. While visiting Chengdu in the Sichuan province of western China, I stayed one whole afternoon observing the pandas at the Chengdu Research Base of Giant Panda Breeding, the largest of the world. Without protection by the government, this breed would rapidly becomes extinct; the female ovulates only for 2 weeks once every two years. They freely roam within a 50-hectare forest being feed twice a day with bamboo leaves, their favorites. Although they seem so cuddly and huggable, they prefer and aggressively protect their space when they're not sleeping. I took this photo as it seemed like only one panda in a mirror. While visiting Chengdu in the Sichuan province of western China, I stayed one whole afternoon observing the pandas at the Chengdu Research Base of Giant Panda Breeding, the largest of the world. Without protection by the government, this breed would rapidly becomes extinct; the female ovulates only for 2 weeks once every two years. They freely roam within a 50 hectares forest being fed twice a day with bamboo leaves, their favorites. Although they seem so cuddly and huggable, they prefer and protect their space when they're not sleeping. 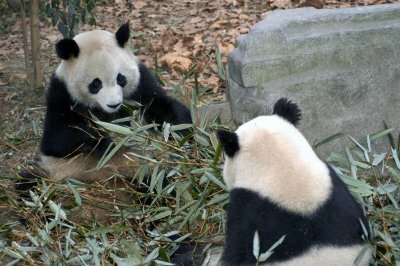 The panda puts the branch between its teeth then slides it, thus obtaining a mouthful of leaves. 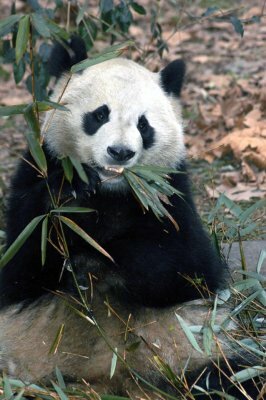 About the size of an Canadian black bear, giant pandas stand between 60 to 90 cm tall at the shoulder (on all four legs), and reach 130 to 200 cm long. Males are larger than females, weighing up to 120 kg in the wild. Females rarely reach 100 kg. There are only about 900 left in the world. THAILAND - CHIANG MAI - Elephants are Thais best friends. On this elephant farm, elephants are taught to haul and manipulate lumber and a few other small chores such as pump and carry water. 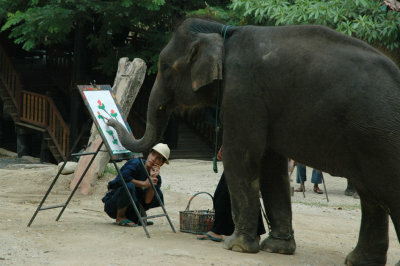 Here, the trainer gave the elephant painting lessons. As I observed every brush stroke, I was confirmed once again of the misunderstood potential of each animal of this planet. 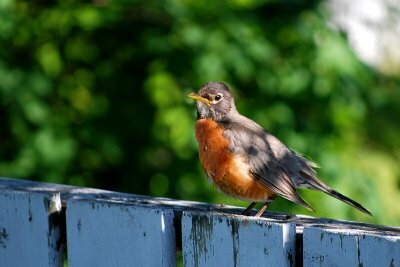 This robin waked me up one morning at my mom's place. As I looked out the window, I told him/her, "You create harmonious music and you're beautiful. Wait till I fetch my camera". Three minutes later, he/she was still waiting. When I told him/her, "You're in the shade, I want to see your bright chest", it moved in the sunlight. Click! 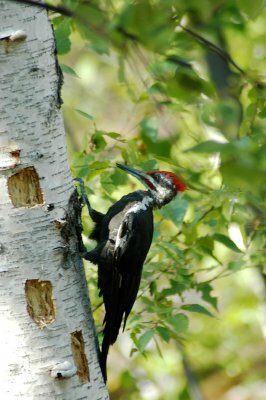 This red woodpecker caught my attention as I was hiking in the Laurentian Trail in Sudbury, Ontario. Being the largest of woodpeckers, this Pilate Woodpecker's song is a simple, low-pitched Cuk-cuk-cuk. As it prefers conifer, birch and other softwood trees, it is common is northern and western Ontario forests. For about 15 minutes, I watched these birds as they seem to be flirting all the time. Then they lived up to their nickname: kissing. In this bird refuge, the Keoladeo Ghana National Park (Bharatpur, Rajasthan province, INDIA), thousands of birds reside or stop during their migration. Bicycling down the narrow road is a an ecstatic experience of harmonious sounds of bird songs. 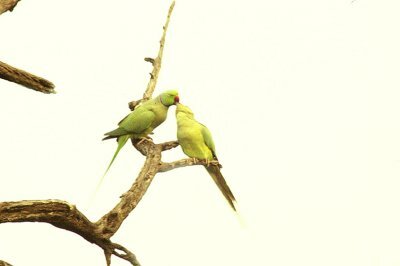 These "kissing birds" (commonly called love birds) though are poor singers sounding much like cockatiels' croak. Kissing communicates much better! Lovely chipmunk picture. Munks rule! Congratulations for using a camera instead of a rifle and sharing such interesting photographs. Hopefully your example will inspire many more to follow your example.